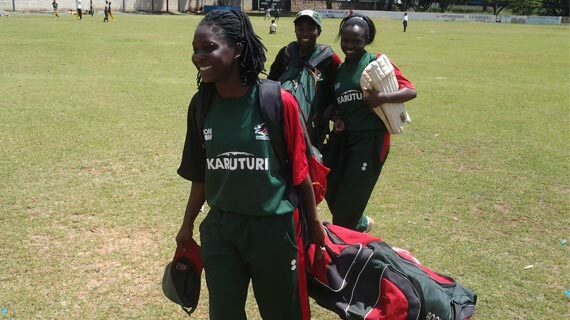 The Kenyan national women Cricket team departs Nairobi on Saturday for Daresalaam Tanzania where they will be taking part in the ICC Africa T-20 regional qualifiers for the women's world cup. The qualifiers run between the 16th and 19th December in Daresalaam with the winner getting direct ticket to the 2014 T20 women’s world Cup in Bangladesh. South Africa, Namibia, Zimbabwe, Uganda, Tanzania and Kenya will be taking part in the qualifiers. Kenya’s first match will be against Namibia on Sunday morning before taking on Uganda on Monday. They will then play South Africa on Tuesday and Tanzania on the final day Wednesday 19th December. The team will be captained by former university of Nairobi Electrical engineering student Emily Ruto who has guided the team for the past four years since 2008. The Kenyan team is a blend of youthful talent and experience with 16 year old Daisy Wairimu of Kiamunyi High School being part of the traveling squad. Amongst the senior players in the team managed by Lameck Onyango include captain Emily Ruto, Beryl Oyugi ,Pearlyne Omamo, Sarah Bakita , Mercyline Adhiambo,Belinda Maska, Ruth Mwihaki, Sharon Juma, Margaret Banja and Mary Belle. Daisy Wairimu, Quinta Aoko and Lydia Kaparo are the youthful names that join the team for the qualifiers. “Cricket is a technical game and one simple mistake could take you out, so we will take one bowl at a time.” She said. The team will be going out for a repeat performance of last year on day one where they defeated Namibia’s team that has very few changes to their squad this year including captain Anneri van Schoor (captain), Chantelle Esterhuizen, Chantelle Esterhuysen and Eunice Esterhuysen, amongst others.